Corby joined FSC in 2011, bringing with him ten years’ experience as a patent and intellectual property litigator in Houston. This field was a natural one for Corby: before law school, he worked in the aerospace and seismic-exploration industries while obtaining both bachelor’s and master’s degrees in computer science. Corby’s undergraduate aerospace experience came in the form of a coveted NASA internship, working on software development for space-shuttle flight simulators. After graduating with his bachelor’s degree, Corby worked for Lockheed Martin developing software for the mission-control center at the Johnson Space Center. Such experience and training give Corby an intrinsic understanding of the technical issues that underlie the intellectual property cases that FSC accepts, allowing him to bring a depth of practical knowledge to the legal issues involved. 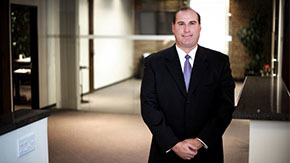 Drawing upon that technical background, Corby’s litigation work both before and since coming to FSC has involved complex technologies in the fields of electronics, computer hardware and software, and wireless communication.